The year 2018 marks the thirtieth anniversary of the publication of Foucault’s Pendulum, the second novel by Umberto Eco, which was a literary phenomenon. In the story, the Italian semiotician puts the reader on the trail of a supposed cosmic plan—drawn up in the time of the Knights Templar—which develops secretly from then until the setting for the novel’s action at the end of the 20th century. Its three protagonists are caught up in the search for the “fixed point” on the Earth’s surface where the culmination of the plan will take place, and whose unknown location would be marked by a Foucault pendulum. «At certain places on the globe the Pendulum completes its circle in thirty-six hours; at the North Pole it takes twenty-four hours; at the Equator the cycle doesn’t vary with the season. So the location matters,» says one of them. Regarding the longitude, it is enough to know the time at the location and compare it with the time on a clock that keeps the time of a reference place (whose longitude is known): e.g. 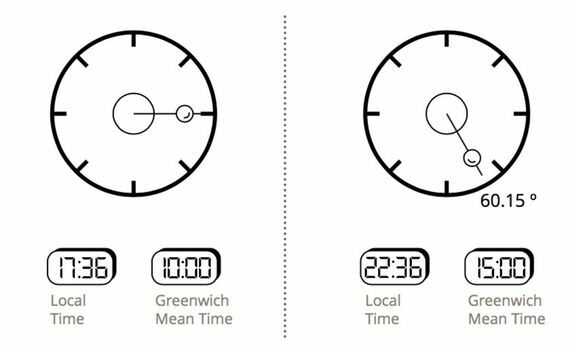 the time on the Greenwich meridian. In January 1851, and with the aim of demonstrating that the Earth rotates on its axis, the amateur physicist Jean Bernard Leon Foucault (18 September 1819 – 11 February 1868) built the first pendulum of this type in the basement of his house. It consisted of a 5-kilogram weight suspended from the end of a 1.98-metre cable attached to the roof. To make the pendulum begin to oscillate without any more momentum than its own inertia, Foucault tied the weight to the wall with a rope and proceeded to burn it with a candle. After half an hour, the displacement of the oscillation plane of the pendulum became evident. Just a few days later, the most prestigious French scientists gathered in the hall of the Paris Observatory to witness for the first time the movement of Foucault’s pendulum. For the demonstration, he held the same 5-kilogram sphere with an 11-metre cable suspended from the roof of the building. The staging was a great success. Shortly after, he held a new public demonstration at the Pantheon in Paris. The new pendulum consisted of a 28-kilogram sphere suspended from the imposing vault by a 67-metre cable. Once free, its plane of oscillation began to rotate at a speed of about 11 degrees per hour. After 8 hours it was at right angles to the original direction. And it took approximately 32 hours to complete the circumference. Since a freely suspended pendulum does not change the direction of its oscillation (once it starts), that obvious rotation could only be due to the planet’s own rotational movement. In addition to making the first demonstration of his pendulum in the Parisian Observatory, Foucault also presented his report to the French Academy of Sciences, on 3 February 1851. In it he enunciated what is now known as “Foucault’s sine law,” a very simple equation that relates the latitude of the place where the pendulum is located with the time it takes to complete one full circle. Foucault formulated his law without any mathematical proof—beyond the observations made in his experiments at home. Looking up Foucault’s sine law, we see that it is formulated as follows: T = 24/sin q, where T is the time in hours necessary for the pendulum to return to its original position after completing one full circle and q represents the degrees of latitude of the location. According to this equation, the pendulum would require 24 hours to complete one rotation at the North Pole and the South Pole (at both points latitude is 90°, and the sine of 90° = 1) and it would not rotate on the equator (q = 0° → sin q = 0 → T = infinity), as the protagonists of Foucault’s Pendulum had already warned us. If our pendulum has covered 60.15° in 5 hours, with a simple rule of three we see that its period (the time it takes to complete one rotation, that is, 360°) is T = 29.925 hours. And taking this figure to Foucault’s sine law, it is easy to determine that sin q = 0.802 and, therefore, we can calculate that latitude (q) is 53.32° north (if it were south, the pendulum would rotate counter clockwise). Even though the key to calculate longitude is explained by many sources, the aforementioned passage from The Island of the Day Before makes it very clear that, knowing the time at the location of the pendulum and, additionally, the time on the Greenwich meridian (longitude 0°), longitude is easily calculated by multiplying that time difference by 15°. Thus 7 hours and 36 minutes is 7.6 hours, and 7.6 multiplied by 15 gives us a longitude of 114°. As the sun rises in the east and sets in the west, as we move eastwards hours are added (while if we travel westwards they are subtracted). This is why we know that our problematic pendulum is east of Greenwich: exactly 53.32° N and 114° E, in other words, in the middle of nowhere, in Eastern Russia.